If you have installation issues on Ubuntu 12.10, check this out. If you have installation issues on Ubuntu Quetzal 12.10, check the updated instructions page for more info. 1. Chose or continue to use a non-certified EHR and get Medicare reimbursement penalties – end result: lower net income. 2. Chose a costly certified EHR, and get possible Medicare incentives to offset the cost – end results: lower net income with increasing overhead. 3. Chose to not use an EHR and get Medicare reimbursement penalties – end results: lower net income. There is one other scenario I didn’t mention and that is for the practice to opt-out of Medicare. If the practice doesn’t already see Medicare patients – this is the no-brainier solution. However, if the practice sees a significant portion of Medicare or Medicaid patients. the practice will see lower net income either way. All of these horrible choices don’t really “incentivize” solo primary care physicians to jump on to the health IT bandwagon. And those that practice the micropractice way, where EHR’s are absolutely vital to their survival, it forces the micropractice to change their practice to become, well, a non-micropractice (high overhead model) or to resort to other sources of funding (monthly membership fees for example) that would exclude patients who would not be able to afford health care with their primary care provider. Now, I understand the politics of trying to improve health care systems and that any policy maker is going to set policy that impacts a larger group or population of providers rather than cater to a smaller group. It is true that solo primary care physicians are already in small numbers and diminishing. As a small group, are we going to be able to change healthcare? Probably not. Most primary care physicians are in larger groups by way of survival but most do so without being happy with their job and patients are not necessarily happy with the care that they receive in this “hamster-wheel” medicine model where productivity is the only measure. It’s gotten this way because in the health care cost pie, primary care physicians have to fight tooth and nail to get every small leftover scrap and in the end, the patients have to suffer. And this dysfunctional, “sick” system has been established from decisions (and every decision since then) made decades ago in the late 1960’s when the US health care system aimed towards higher specialization and focus on treatments and not really about prevention. Firstly, the money isn’t there, nor is it considered “profitable” to support prevention. It’s difficult to “measure” prevention because it’s not a productivity defined idea. It’s difficult to measure success for life habit changes because people are human beings, not widgets or robots. I believe there are ways to measure it (and some other countries do), but to do so, it would require a 180 degree re-think about how we view health care, how it fits with financing health care in a FINITE framework (not INFINITE) and retooling the medical education system where primary care IS the cornerstone to good health, both for the individual and the public. Below was a comment I made on a KevinMD blog post; I felt that I should post it as it really encapsulated what I wanted to say in my last few posts regarding primary care physician struggles. Kristy, very important points and questions. What Dr. Schimpf and Mr. Qamar has suggested really is an adaptation to dysfunctional system, not a fix. By no means, is a direct pay model a viable, sustainable solution to the root cause of this dysfunctional system. It certainly gives breathing room for PCPs who have been suffering for so long (like me) that having a model like this is so refreshing and energizing. However, a direct pay model will not help those that cannot afford it (even $19 a month). I have patients who would like to see me, but can’t, because even though they have health insurance, it’s high deductible and they need to pay out of pocket with funds they don’t have. Ones without insurance, forget it. They’ll come when the problem is so severe that they can’t help themselves via Google, and then it’s too late or the condition needs such drastic, expensive measures to treat that the cost of treatment is so much more than what it could have been had they had easy access to a PCP in a timely manner. It is all about equal access and the rights of everyone in the country (not just those that can afford it) for health care that really impacts health care expenditures in the long term. It’s like trying to putting a tourniquet on a severed artery, but without a fix to the severed artery, we’re just stopping the bleeding. Eventually, the bleeding will go somewhere else or cause secondary problems that are just as life threatening as the initial injury. The fix is comprehensive, starting with basic health care access for all and coming up with solutions to address the primary care physician shortage, both by prioritizing preventative services, increasing the workforce through medical education and restructuring cost allocations so that there is closing of the extreme gap between PCPs (including especially mental health providers) and subspecialist reimbursement rates. Although I’m sure these suggested fixes (or variations thereof) have been proposed before, I believe change in our healthcare system really will only change with a grassroots education movement in the value of primary care. We have plenty of data from here and from other countries’ experiences to back up our point. We’re way past the point where primary care physicians can ask for change to the powers that be because the vested interests preserving this dysfunctional system are so strong and entrenched. My wake up call was when I was in the process of closing my practice, most of my patients didn’t know that a primary care physician gets paid for so little (less than a optometrist! ); they felt that the value in their health care from me was so much more than that…they couldn’t understand how I was able to keep surviving on so little for so long. They kept saying, “If we only knew, if everyone knew, we would all be rooting for you”. It was too sad, but it gave me hope where our fight has to be directed, where our best efforts for change can be successful. In July, the National Center for Health Statistics came out with a report about EHR adoption in 2011. 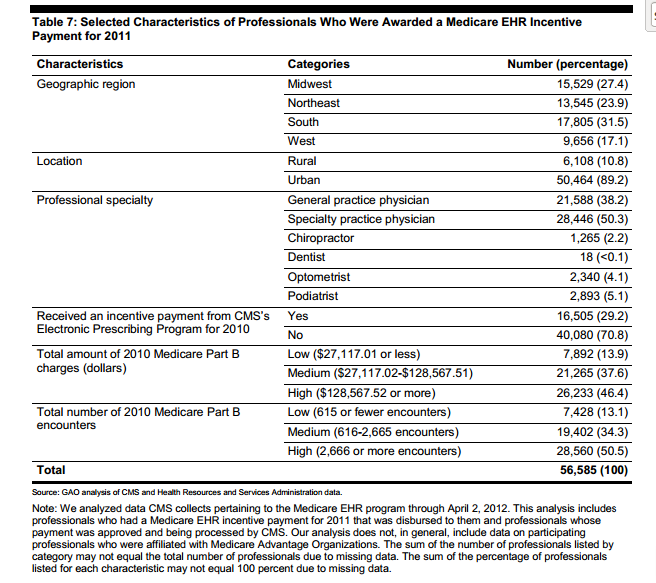 Then, the Government Accountability Office released a report to Congress in July, 2012 about the percentage of physicians who were awarded Medicare EHR incentive payments in 2011. So, in a nutshell, 58% of primary care physicians in the US have adopted EHR’s but only 38% of them were awarded incentive payments. 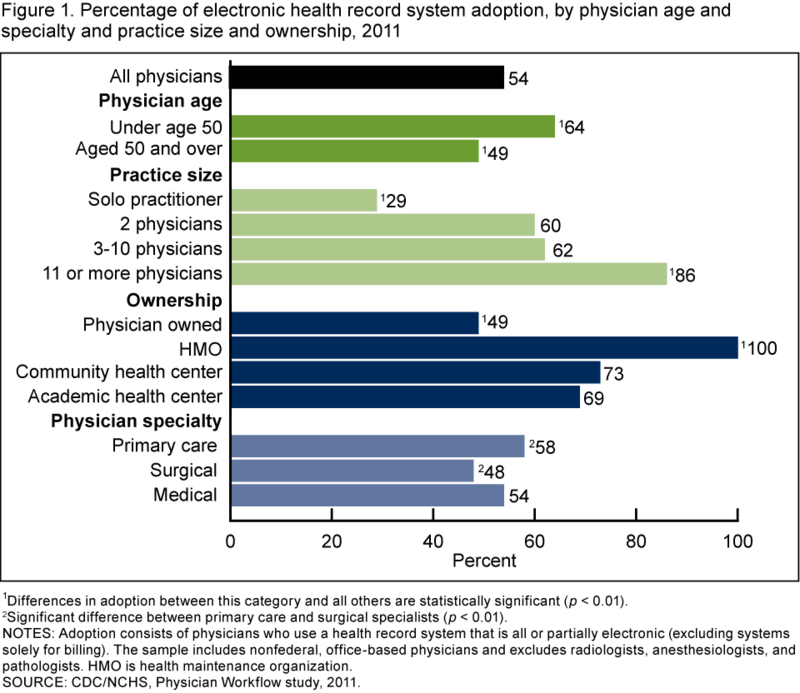 Also, as a interesting note, only 29% of solo doctors have adopted EHRs. I wonder why…cost, perhaps? If you connect the dots from the previous headlines together, the solo, primary care doctors are in a rock and a hard place. Not only are we not getting adequate reimbursements, we’re getting squeezed by external mandates, forcing us to choose between using expensive technology versus no technology at all. And those that want to use technology (or need to, like the micropractices)are having to choose between using technology and dropping Medicare patients (income loss), keeping Medicare patients with pending penalization (income loss yet again), or suffer net income losses by rising overhead expenditures in the form of paying for expensive, certified EHRs (income loss). It’s a LOSE-LOSE-LOSE situation. How often does that happen when you’re in a 3 way lose situation?! I added a grid to demonstrate all the functionality of NOSH ChartingSystem that is standard out of the box so that one knows how NOSH functionally meets most of the criteria for Meaningful Use, just not the certification. Margalit Gur-Arie recently wrote about the concept of the Patient Centered Medical Homes (PCMH) and debunked some of the worries that this concept may bring to physicians. In my opinion, NCQA’s approach by setting out the standards as a roadmap is a better way to put forward the idea of the patient centered medical home rather than the Meaningful Use approach for EHRs where you’re having to “prove” that you are using the tools that they literally force you to use at a cost and promising some of that money back. If this patient centered medical home concept doesn’t get hijacked by other corporate interests, I think there is a good future for revitalizing primary care. However, I think that there is still a strong underlying culture of thinking there is an infinite amount money to be made in health care, and so the pressure will continue to morph this into something else that loses the essence of the idea. None of these ideas presented in PCMH are necessarily groundbreaking if you’re already a primary care physician. There really shouldn’t be a kind of expectation that every practice has to be molded in the same way from coast to coast. I believe in my previous work as a micropractice family physician, I had all of these goals in mind when I developed my practice and actually acted upon those goals. The appearance of the practice was certainly unconventional and in the minority (in the midst of large multi-specialty practices), but it doesn’t mean it can’t be done. Same here with my NOSH ChartingSystem project. I don’t aim for conventionality; I aim for what is the best way for doctors to be able to use technology to actually help (rather than hindering) do their jobs. Being a non-certified product certainly is not conventional either, but I’m banking on creating a powerful movement to counter the current conventions about health IT.